- Color : Black, Red, Silver Tone. - Net Weight : 22g. - Overall Size(Pole not included) : 20 x 6 x 10mm / 0.8/ x 0.2/ x 0.4/ (L*W*H). 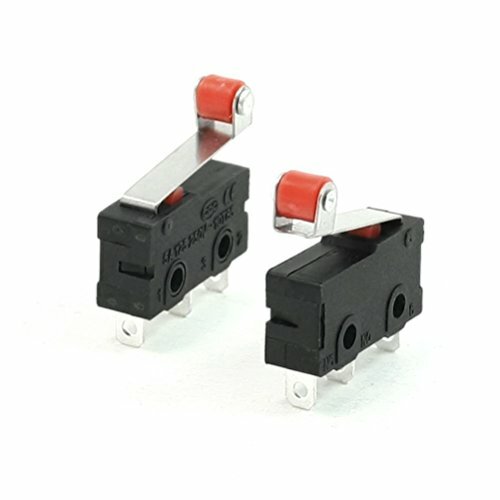 - Hinge Roller Lever Length : 18mm/0.7/. - Roller Diameter : 4.5mm/0.2/Mounting Hole Dia. : 2mm / 0.08/. - Snap action contacts have different trip and reset points. The distance between the trip and reset point is called the travel to reset, hysteresis, or differential. Finite travel to reset helps to avoid multiple changes of state if the object actuating the switch is subject to vibration. - Snap action contacts ensure repeatable performance in applications that involve low speed actuators. The amount of travel of the contacts is also not dependent on the amount of travel by the actuator.